It opens with this pitch-perfect quote by Joan Didion: "It kills me when people talk about California hedonism. Anybody who talks about California hedonism has never spent a Christmas in Sacramento." So on point, and the perfect setup for the pedestrian tone and prosaic nature of the film, which is intimate, sleepy, and quiet as cats' paws. I'm not quite sure what to make of the film, though. It's a bit like Coco: for some folks, it's "amazing," and rests around an 8.5 on IMDB, but I think my general impression was boring. I'm sorry to harp, but it goes back again and again to the absence of music. I just find silent pictures virtually unwatchable. Like paint drying. 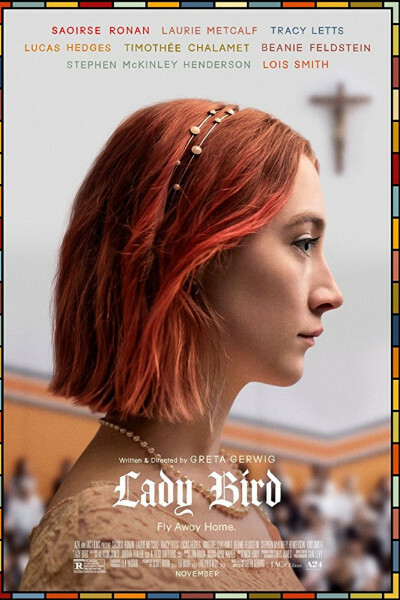 Alas, Saoirse Ronan is a beautiful creature: quiet, delicate ivory, and just like in Brooklyn (in which very little happens), she's endlessly watchable. Her star is rising, and will continue to do so. But, for my money, it woulda been a more immersive movie experience if it'd had a killer 2002 soundtrack, which is the year in which it occurs. Good, and perhaps quite good at times, but never classic, never A-MAZING, and A-MAZING is what I went for.